It’s the first week of the baseball season and you know what that means: time to get excited by hyperbolic extrapolations of small sample sizes. Madison Bumgarner is the next Shohei Otani! The White Sox are going to play .500 ball! And Yasiel Puig is back, baby. Puig had an explosive first two seasons in L.A., followed up by two years of feuding with Dodgers brass and struggling to recapture the kind of on-field production that made fans quick to forgive instances of questionable effort or poor decision-making. In 2016 Puig slugged just .416 and a mere 11 home runs, a performance that earned him a month in the minors. According to Statcast, the second dinger set a new personal best for Puig—at 110.9 mph, it was his hardest-hit home run. Yes, all this offense came against the Padres, who are essentially out of contention already, but the Dodgers sound cautiously optimistic. 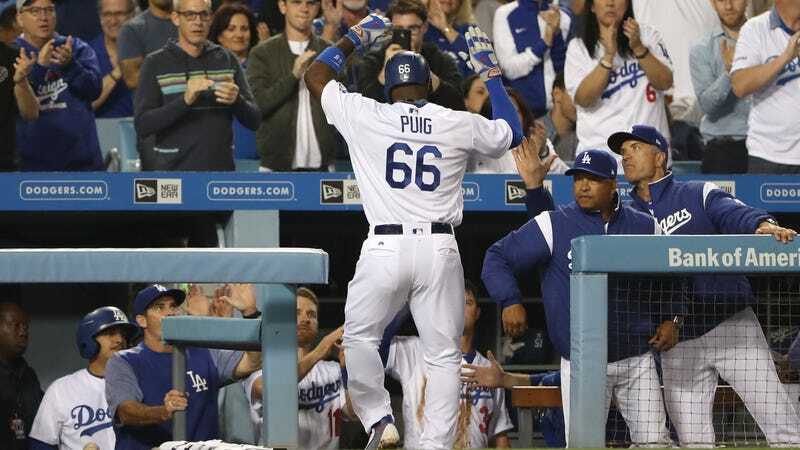 Manager Dave Roberts told the Associated Press after last night’s game that Puig’s struggles stemmed in part from pitchers learning how to get him out and that even this limited span of success is a testament to Puig’s counter-adjustments and improved plate discipline. Now 26, Puig himself chalks up the turnaround to newfound maturity—or maybe he’s just learned to parrot what middle-aged white dudes with baseball columns have been saying about him. Even if you’re not a Dodgers fan, a productive Yasiel Puig is good for baseball’s fun quotient so here’s hoping that the dingers keep flying. What&apos;s Going On Between The Dodgers And Yasiel Puig?